Acing undergraduates in psychology-themed “Jeopardy!” is not part of the typical job description for assistant professors. For Sarah Gaither, ‘03, however, it is — and so is teaching three classes and running a self-created lab at Duke University. Gaither is a social psychologist whose work focuses on how different experiences with diversity influence human behavior and our perception of others. Specifically, she explores three issues: the influence of contact between different groups on interracial interaction outcomes, both for the racial majority and minority; the effect of multiple racial or social identities on various types of behavior, including complex thinking, social behavior and identity malleability; and what contexts can influence how people perceive or socially categorize each other across group boundaries. Gaither has been an assistant professor in the Psychology and Neuroscience Department at Duke since fall 2016. She also founded the Duke Diversity and Identity lab in 2016 and still heads it. Gaither received her bachelor’s degree with honors in social welfare with a concentration in psychology and a minor in Spanish from the University of California, Berkeley in 2007 but said she had no idea what she wanted to do other than work with people and help them in some way. So she applied to different full-time research assistant positions to gain experience. Inspiration struck during her two gap years working as a lab manager for Scott Johnson in the University of California, Los Angeles psychology department. There, Gaither designed and ran one of the first studies using eye tracking with biracial infants. 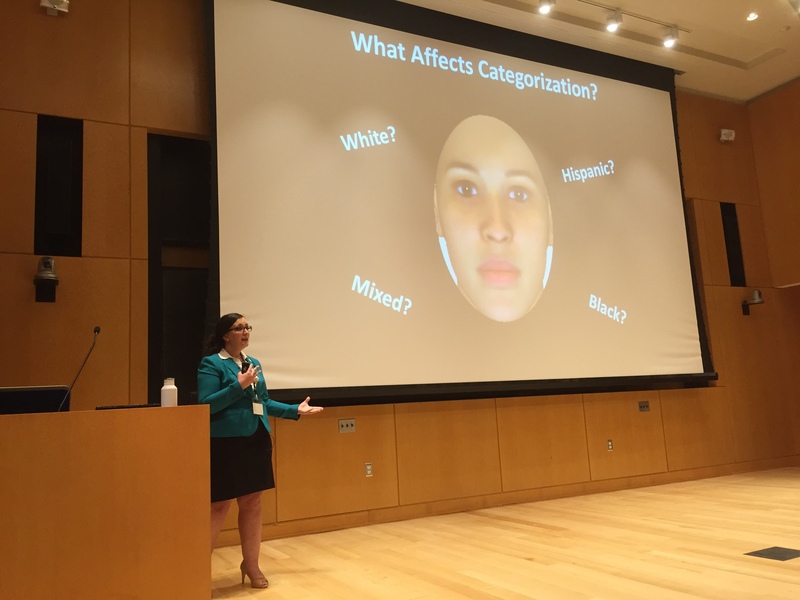 She found that biracial infants scan or distinguish faces faster than monoracial infants due to the exposure they get in their homes to faces from two different racial backgrounds. The study was among the first to recruit a biracial infant sample, and Gaither said she discovered how little research there was regarding the biracial demographic. This lack of research was especially important to Gaither because she is biracial herself (she has a white mother and black father) and had witnessed how differently her family members were treated based on their physical appearance. Gaither was inspired to further her research and apply for Ph.D. programs after finishing her work as a lab manager in 2009. In 2014, she obtained her Ph.D. from Tufts University in the Boston area and won the Provost’s Postdoctoral Fellowship, which provides up to two years of funding for junior scholars from diverse backgrounds, at the University of Chicago. Gaither has contributed to 25 journal articles since 2014; her work has earned the Society for Personality and Social Psychology’s Outstanding Graduate Research Award, Tufts’ Outstanding Academic Performance at the Doctoral Level Award and The Provost’s Multiethnic Graduate Student Alliance Award. Gaither said tenure-track positions were very competitive, but luckily she got an interview at Duke. Since joining the faculty in 2016, Gaither has done much more than research, such as managing all aspects of the Diversity and Identity Lab. She verifies approvals by the Institutional Review Board (which protects the rights and welfare of human research subjects in studies), sends grant applications, ensures funding, hires research assistants and trains undergraduate and graduate students. Although Country Day didn’t offer psychology classes, the small student body allowed her to participate in multiple activities — such as athletic teams, the Octagon and the concert and jazz bands — that first opened her eyes to the various identities possessed by someone at any moment. “I became an expert during my time at Country Day in learning how to read different social behaviors and writing effectively, which helped me immensely in graduate school,” Gaither said. In addition to fulfilling her lab responsibilities, Gaither teaches three courses. The first, Introduction to Social Psychology (a large introductory course for undergraduates), focuses on how human identities and behaviors are influenced by one’s surroundings and experiences. The second class, The Self & Social Identities (a small lecture course for undergraduates), covers diversity issues in psychology research, and, according to Gaither, pushes students to consider if a set of findings applies to other scenarios. Lastly, Gaither teaches Diversity in Psychology (a first-year seminar for undergrads) on social identities, asking students to analyze their identities using past theoretical work. Gaither’s seminar class visits Duke’s art museum and examines five pieces using identity-related psychology theories to pinpoint different motivations for the art or to explain what types of identities the students see. Between teaching, mentoring undergraduate and graduate students and doing her own research, Gaither said she is “pretty busy” — but that hasn’t stopped her from other pursuits. She recently served as an expert witness for a court case involving a biracial child custody issue and regularly gives diversity training talks to businesses. Gaither said she also hopes to start some work in diversity consulting (ensuring a corporation’s practices are fair and inclusive) soon. And she doesn’t spend all her lab time testing; Gaither said she “firmly” believes in balancing work and play. For Gaither, every day is a little bit different, which she said she enjoys. Each week she teaches two classes, holds office hours and student meetings and writes as much as possible for publications needed for tenure. “But each week, (there are) new study ideas, new collaboration opportunities, and new grant and conference deadlines, so I really like the variability of the type of work I get to do every day,” Gaither said. Gaither added that she enjoys being her own boss. Of course, deans and provosts are technically her bosses, but she said she is able to create and control her research plans, teaching approaches and student meetings. Living in Durham has been easy for Gaither as well. “The people are incredibly friendly, (and) the cost of living is also great in comparison to the other bigger cities I lived in before this position — (such as) Chicago, Boston and Los Angeles,” she said. But not every part of her research is easy. One of Gaither’s biggest challenges, she said, is getting the increasing number of participants required for her case studies, especially since finding members from underrepresented groups can be a fight against the clock — and her checkbook. Although recruiting underrepresented adult participants has become less time consuming because of the internet, Gaither said online studies are limited in what they can observe and measure, especially in social behavior. Furthermore, a diverse sample size costs more money to recruit than a white one because diverse volunteers are tougher to locate, according to Gaither. Nevertheless, Gaither said her students make her extra effort to conquer challenges worth it.